There is no way to overstate the importance of good communication as being a necessary skill in becoming a successful leader. In fact, clear communication is so important, there is virtually no chance for an individual to lead his team to success. To be clear, there is no doubt that there are other factors that are necessary. A leader must identify with his team members and get them to feel that he is much like they are. A good leader must show strength, resilience, and ingenuity. A good leader must inspire and motivate even when all seems lost. And finally, a good leader must be tireless in pursuit of his/hers and their team’s goals. However, if you read the biographies of top military commanders, great sports coaches, and business icons, there will always be an emphasis on the fact that they were able to deliver effective communication that underpinned the success of the campaign or the company. Good communication is more than just saying words, however it is the delivery and a consistency of what is said that is also important in being effective. 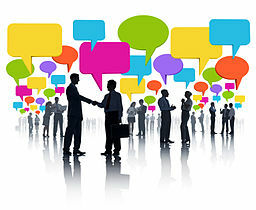 Your tips here are insight of how the great leaders communicate. How you deliver your communication, whether it is verbal, written, or some other way, is very important. No point gets across because of flowery vocabulary or words with five syllables. Effective communication depends on the living a simple and clear message that anyone and everyone will understand. Great leaders know that if the communication is too complicated it can be misinterpreted, and misinterpretations increase the chances of failure. So even if they have a broad vocabulary, they keep things simple and it guarantees them a high level of responsiveness of what is being attempted to convey. Timing is everything in business, and great leaders know that when they communicate something is often just as important as what it is they’re trying to say. Timing can make the difference between your team being motivated about the topic you’re communicating or being apathetic. There are times when someone on the team does not perform, and criticism is required. A great leader is always prepared to criticize so that the team member understands his role in what went wrong. But a good leader also understands that if criticism is not delivered in the context of pointing that team member toward how to improve, the team member will either become angry or bitter. Either mental state will result in the team member being ineffective. Therefore the focus when criticizing is partially on what someone did wrong, but equally on how to get it right the next time. Every good communicator is a better listener and has honed is listening skills with an understanding that this is a core part of communication. Leaders naturally speak the floor and expect to be heard. They want the team to know that their words are important so they look for opportunities to speak. Great leaders know that team members want to feel like they are appreciated and are heard. They go out of their way to solicit opinions and feedback and are careful to not interrupt or shut someone down, particularly if they don’t agree with what’s being said. They hear the person out, and when they are sure the person is finished, they calmly respond.